Bolivia adventure holiday. Helping Dreamers Do. This 11 day small group holiday is guaranteed to take your next adventure to new heights. Bolivia is a magical place which combines indigenous traditions and colonial heritage with some of South America's most sensational scenery. 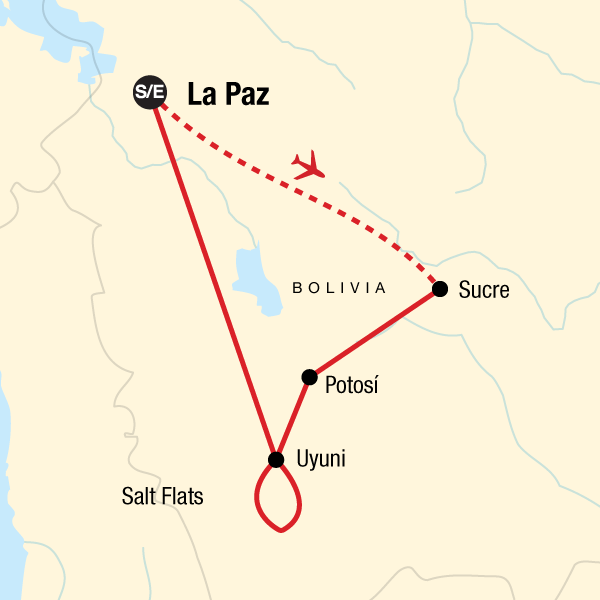 Set your pulse accordingly on a round-trip from La Paz, the highest capital city on the planet, via Potosi, Sucre and the Uyuni Salt Flats. Nowhere compares to the Andes, and a three day 4x4 excursion into the saline plains and surrounding desert altiplano will leave you under no illusions as to the majesty of Bolivia’s natural world. Pockets of life exist across the highest reaches of the Andes and finding out more about indigenous Bolivian rural culture will be just as important as experiencing the country’s colonial history and incredible landscapes. Get ready for an authentic South American adventure that will take you off the beaten track and into a unique and surreal world in the company of local guides and newfound friends. We have developed a non-profit organization, the Planeterra Foundation, created as a way to give back to the people and places that we visit on our tours. This trip offers travellers the opportunity to visit one of the organizations that we support. In Sucre you may visit a home for over 50 orphaned children where you will be able to spend time with the children and learn about the programs they offer. Children are provided with food, shelter, education, healthcare and workshops that develop workmanship skills. Hiking in the Cocora Valley. Talk to the locals, they are really lovely people. Be ready for some long travel days. should have been for this type of trip. Visiting the salt flats - they were beautiful, and totally original. A real experience! Insist that your tour leader comes with you on the 3 day tour of the Uyuni 4x4 tour - the drivers are completely irresponsible (drinking beer at breakfast, driving dangerously, driving the vehicles when they are not roadworthy), and rude (not listening to the group's concerns regarding the above, and threatening to leave people stranded in the middle of the tour), that it is imperative that the tour leader is there to take control. Thank you for your comments. It is pleasing to learn you had an enjoyable time overall, however, obviously the commentary in relation to the drivers in the Salt Flats is of concern. Please rest assured we are reviewing this with our contracted parties in this area and shall take corrective any actions necessary.